MediaWikiShibboleth is the name of a MediaWiki extension created by ULYSSIS to allow for Shibboleth (Centrale KU Leuven) login. The extension disables editing and creating of (talk) pages by anonymous users, and requires Shibboleth account creation and login. 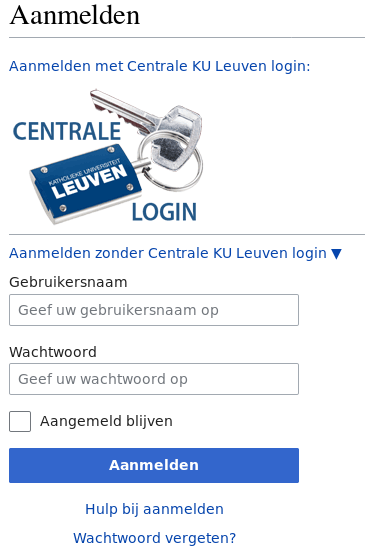 Before installing, you need to have SSL and Shibboleth (Centrale KU Leuven) login enabled on your domain. For instructions on how to get SSL: https://docs.ulyssis.org/Getting_SSL Information about requesting Shibboleth: https://docs.ulyssis.org/Shibboleth Once you know everything is installed properly, you can proceed to install the extension. If you want to allow anonymous editing, you should not add the last 4 lines of the previous paragraph. 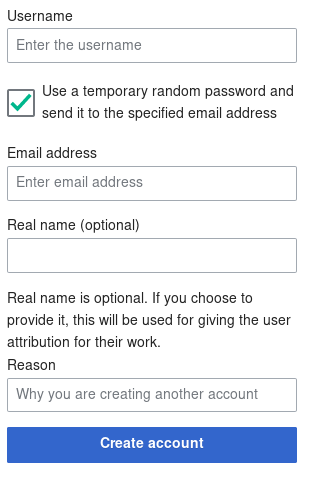 When the extension is installed successfully, anonymous users will not be able to create an account and the account creation page will be removed from the home page. On the log in page, a new image is added: if you click on this image, you will be logged in using Shibboleth. If you want to log in with an explicit username/password combination, you can click "Password Login" to expand a login menu.